They did have two 1:12 Collective figures, but we previously saw the Judge Dredd and Dark Knight Returns 1:12 Collective Figures earlier during the show. So we didn’t duplicate those pics here. You can check out those awesome figures Here. 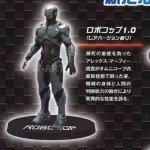 New images were released today of the upcoming ThreeZero Robocop EM-208 along with a preorder. The EM-208 is a military enforcement robot created by OmniCorp, you can test his AI in sparing battles with RoboCop V1 and V3, which we will be rolling out for pre-order later this year. 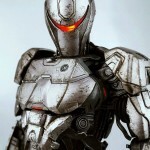 Check out all the new Robocop EM-208 images after the jump. 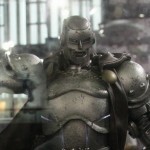 We saw ThreeZero‘s impressive looking Robocop figures during Toy Fair 2014. If you thought they would stop at just three figure, then we have a pleasant surprise for you. ThreeZero has revealed the first photos of a Robocop 2014 EM-208 1/6 Scale Figure. these OmniCorp drones would make perfect army builders…If they weren’t going to be $250+ each. the sculpt is still a work in progress. There also appears to be a chase variant Robocop 3.0 figure as well. Check out the photo after the jump.